Despite its rhetoric on responsible business, Europe has prioritised profit over people, said civil society organisations after European Union (EU) institutions agreed on a new law intended to tackle the European conflict minerals trade. The extraction and trade of minerals has been linked to conflict and human rights abuses around the world. The EU is a major destination for minerals, with companies bringing them into Europe in both their raw form and as part of everyday products from laptops and mobile phones to engines and jewellery. 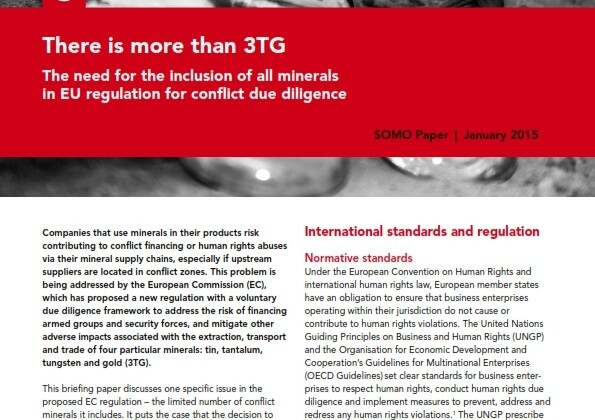 After months of negotiations, EU institutions have reached agreement on a law designed to make sure that minerals entering the EU have been sourced responsibly and without funding conflict and human rights abuses. The agreement represents a first step in the right direction, but the law ultimately risks falling well short of its intended objective. EU policy makers have caved in to the demands of big business by exempting the vast majority of EU companies trading in minerals from the law. By agreeing to exempt these corporations from the law, the EU has instead put its faith in the hope that companies will choose to source minerals responsibly without being required to do so. This has been tried before, through voluntary standards. 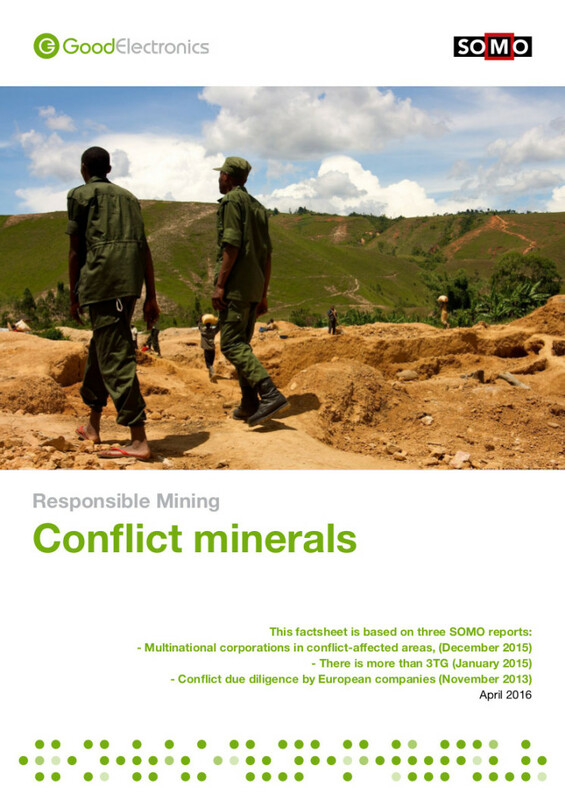 These have had minimal impact, as there are still far too few companies taking steps to check their supply chains for conflict and human rights risks. The agreement promises a review of the law’s effectiveness few years after application. Communities that continue to bear the cost of irresponsible trading, as well as civil society organisations across the world, will now be looking to Europe’s governments to prove that the law delivers on their promise to ensure that European businesses source responsibly. Only then will Europe and its companies be part of global progress towards making mineral supply chains more transparent, responsible, and sustainable. 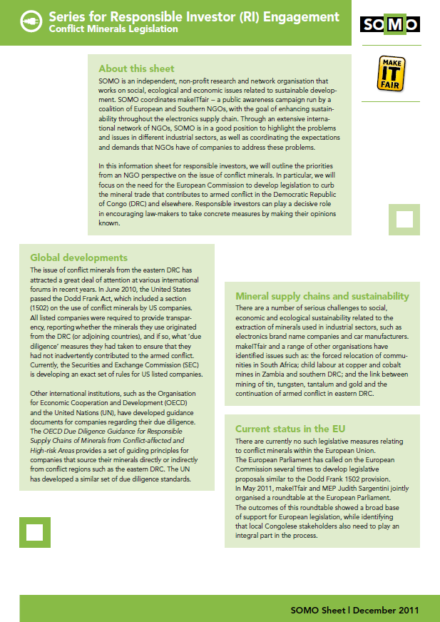 SOMO is part of a broad coalition of NGOs that calls for strong EU initiative on mineral sourcing. This is the coalition’s reaction to the EU outline deal that has been reached 15 Jue 2016. 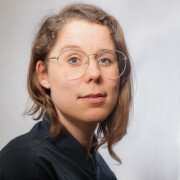 On 26 May, SOMO organised a Roundtable in the European Parliament, together with Judith Sargentini (Member of European Parliament, GroenLinks). 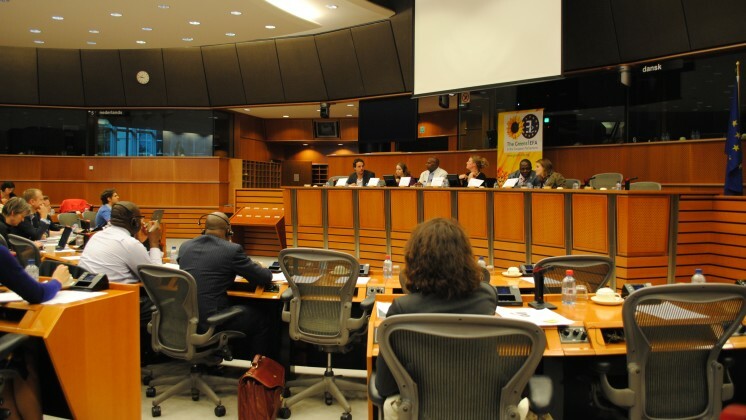 This well attended meeting focused on conflict minerals from the Democratic Republic of Congo (DRC)…. 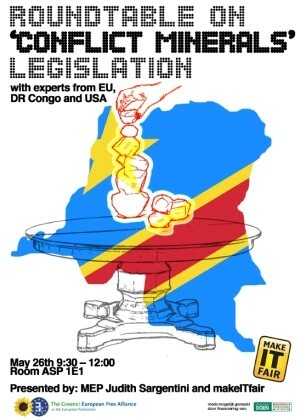 On May 26th, SOMO, on behalf of the makeITfair campaign, and Judith Sargentini, Member of European Parliament for the Greens/European Free Alliance, are organising a roundtable on the issue of conflict minerals from the DRC….